DnBuster's Place: "Welcome to the World" Sweepstakes featuring Purex Crystals for Baby. "Welcome to the World" Sweepstakes featuring Purex Crystals for Baby. Purex Crystals for Baby! A great new scent for the little ones. 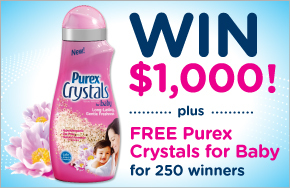 One lucky grand prize winner will receive $1,000 and 250 2nd place winners will receive a coupon for a free bottle of Purex Crystals for Baby!